The Arizona Game and Fish Commission will hold a telephonic meeting at 1 p.m. on Tuesday, Jan. 10, 2012 (TODAY), to be briefed on the status of state and federal legislation, including Arizona HB 2072 (sale of big game tags). The meeting will be hosted at the Game and Fish Department headquarters at 5000 W. Carefree Highway in Phoenix (1.5 miles west of I-17). The commission will be briefed on HB 2072 and potential implications of its implementation, if any, to the department. To view HB 2072, visit www.azleg.gov/legtext/50leg/2r/bills/hb2072p.pdf or www.azleg.gov/DocumentsForBill.asp?Bill_Number=HB2072&Session_ID=107. Members of the commission will attend either in person or by telephone conference call. The commission may vote to take a position or provide direction to the department for coordination, action, or proposed changes to legislation. The public is invited to attend. The meeting will be webcast at www.azgfd.gov/commissioncam. However, those wishing to submit “blue slips” to present oral comment during the meeting must do so either in person at the Phoenix meeting or at any of the six regional Game and Fish offices where the webcast will be streamed (Pinetop, Flagstaff, Kingman, Yuma, Tucson, Mesa). For a list of office locations, visitwww.azgfd.gov/offices. We have learned through Arizona Game and Fish that Mexican authorities released five Mexican wolves in the San Luis Mountains in Sonora, Mexico, on Oct. 12, 2011, approximately 80 miles south of Douglas, Ariz.
Mexico’s desire to release wolves in Sonora as part of its recovery effort has been known for the past two years, although the exact timetable for release was unknown. “Mexico is a sovereign nation with its own wildlife conservation and recovery goals. The vast majority of historic habitat for the Mexican wolf is actually in Mexico, and long-term full recovery of the sub-species is incumbent on successful recovery there, as well as our recovery efforts in the U.S.,” said Larry Voyles, director of the Arizona Game and Fish Department. Game and Fish will continue to work with the U.S. Fish and Wildlife Service to determine how the wolves will be monitored and managed if animals cross the international border. The Arizona Game and Fish Department has been actively involved in the multi-agency effort to reintroduce Mexican wolves to portions of their historic range in the east-central portion of Arizona (and adjacent New Mexico) for many years. In 1998, 11 captive-reared Mexican wolves were released into the Blue Range Wolf Recovery Area (BRWRA) in eastern Arizona. The current population in Arizona-New Mexico was assessed to be approximately 50 animals during 2011 monitoring. 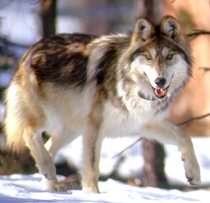 The Mexican wolf is considered endangered in the United States and Mexico. Game and Fish continues to express concern over the lack of progress in aspects of wolf conservation. Voyles added that wolf management is an emotional issue with potential effects on the human environment, as well as the natural environment. Everyone engaged in wolf management has a responsibility towards open and transparent coordination and information sharing with Arizona stakeholders, as mandated under provisions of the National Environmental Policy Act (NEPA). Voyles said Game and Fish will make every effort to work with the Fish and Wildlife Service, neighboring states, counties, and Mexico, to the extent that transparency allows, to manage and conserve wolves in Arizona. This is the entire text of the AZFGD news release of Oct 20, 2011 on this subject.